Linden House has two excellent dental hygienists both of whom are professionally trained to treat gum disease and develop good dental health practice in our patients. 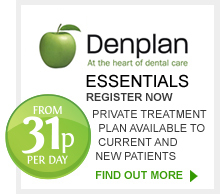 They provide guidance on everything from simple scale and polishing to dietary advice or the creation of individual dental health care programmes. PREVENTATIVE DENTAL CARE is the modern way of reducing the amount of dental treatment necessary to maintain a healthy mouth. With ongoing co-operation between your dentist and hygienist, preventative dentistry can change the traditional pattern of CONTINUING TREATMENT to one of CONTINUING DENTAL HEALTH so your teeth last a lifetime. A HEALTHY SMILE IS A GREAT ASSET. HERE ARE OUR TOP 8 TIPS FOR MAINTAINING YOUR ORAL HEALTH. Your dentist will first assess your teeth and gums and discuss with you any treatment necessary. Our two experienced dental hygienists, Kate and Michelle can provide dietary advice, oral hygiene advice and preventative treatments to protect your teeth. Professional cleaning leaves your teeth smooth and clean, removing deposits and bacteria and thereby preventing gum disease. Scaling and polishing can also remove unsightly discolouration. Linden House Hygienists are also qualified to advise and carry out tooth whitening. Topical fluoride treatment is now available in the form of a varnish. This helps strengthen teeth and protect against acid attack. Preventative dentistry includes the sealing of deep grooves or fissures in posterior teeth using a clear or tooth coloured resin. The fissure sealant forms a protective layer preventing bacterial and acid attack. Gum disease is a major cause of tooth loss. In addition medical research now indicates people with advanced gum disease are more likely to suffer illnesses such as stroke and heart attack. Linden House hygienists work closely with the dentists to provide the most up to date gum treatments available. Dental Erosion is the loss of enamel caused by acid attack. When enamel is worn away it can lead to pain and sensitivity. Acidic food and drink can be harmful. Our hygienists will undertake dietary advice and treatment to alleviate the problems caused by dental erosion. 8. AND FINALLY …ITS NEVER TOO LATE TO START! With modern dentistry and constant new developments it is possible to prevent or considerably reduce dental disease.